Caring for children who are ill challenges every nurse to function at the highest level of professional competence. Giving medication is one of the most important nursing responsibilities. 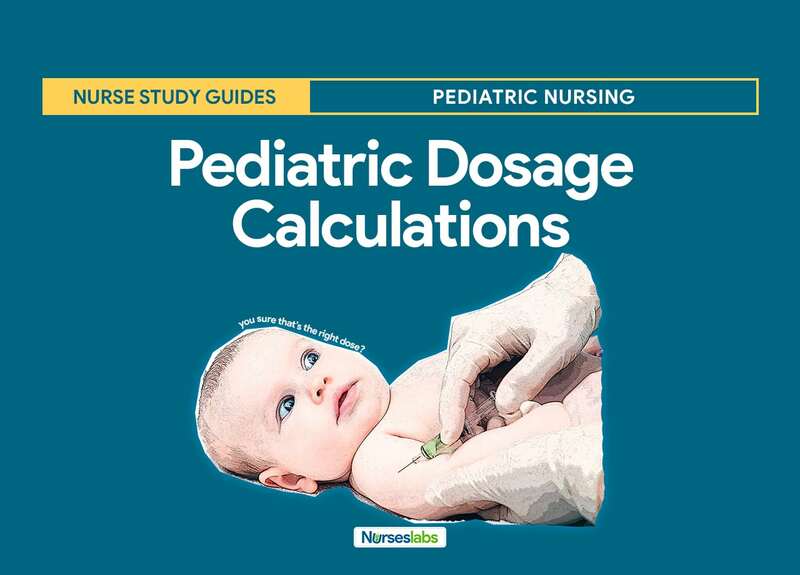 Commercial unit-dose packaging sometimes does not include dosages for children, so the nurse must calculate the correct dosage to provide safe and effective care. Two methods of computing doses are used to determine accurate pediatric medication dosages: the body weight method and the body surface area method. The first method of computing dosages uses the child’s weight. Weight in kilograms. The child’s weight in kilograms is used to calculate a safe dose range for the child. To use the body weight method of dosage calculation, a child’s weight recorded in pounds has to be converted into kilograms. Set up a proportion using the number of pound in a kilogram in one fraction and the unknown weight in kilograms in the other fraction. For example, for a child weighing 42 pounds, the conversion is set up as follows: = The fractions are then cross-multiplied: 2.2 lb x Xkg= 1 kg x 42 lb; the problem is solved for X.
Divide each side by 2.2 and cancel the units that are in both the numerator and the denominator; = X= X= 19 kg. The child who weighs 42 pounds weighs 19 kilograms. After converting the child’s weight into kilograms, a safe dose range for that child is calculated. For example, if a dosage range of 10 t0 30mg/kg of body weight is a safe dosage range and the child weighs 20 kg, calculate the low safe dose using the following: = Cross multiply the fractions: 10mg x 20kg = 1kg x Xmg. Solve for X by dividing each side of the equation by 1 (canceling the units that are both the numerator and the denominator): = 200 x 1 =1X200 = X. The low safe dose range of this medication for the child who weighs 20kg is 200mg. To calculate the high safe dose for this child, use the following:= Cross multiply the fractions: 30mg x 20kg x Xmg. Solve for X by dividing each side of the equation by 1 (canceling the units that are in both the numerator and the denominator): 30mg x 20kg =600×1= 1X600=X. The high safe dose range of this medication for the child who weighs 20 kg is 600mg. The second formula used to calculate dosages is the body surface area (BSA) method. West nomogram. The West nomogram, commonly used to calculate BSA, is a graph with several scales arranged so that when two values are known, the third can be plotted by drawing a line with a straight edge. The child’s weight is marked on the right scale, the height on the left scale. Use a straight edge to draw a line between the two marks. The point where the lines cross the column labeled SA (surface area) is the BSA expressed in square meters (m2). The average adult BSA is 1.7 m2; thus the formula to calculate the appropriate dosage for a child is estimated child’s dose. For example, a child is 37 inches (95cm) tall and weighs 34 lb (15.5 kg). The usual adult doe of the medication is 500mg. Place and hold one end of a straight edge on the first column at 37 inches and move it so that it lines up with 34 lb in the far right column. On the SA column, the straight edge falls across 0.64 (m)2. You are ready to do the calculation. =0.38; you know now that the child’s BSA is 0.38 that of the average adult. You are ready to calculate the child’s dose by multiplying 0.38 times 500mg: 0.38×500= 190. The child’s dose is 190mg. Double-check the computation. The nurse should always have the computation checked by another staff person qualified to give medication or someone in the department who is delegated for this purpose. Compute separately. Errors are easy to make and easy to overlook; a second person should do the computation separately; then both results should be compared.